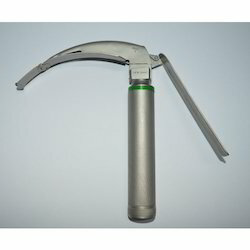 We offer top quality Reusable laryngoscopes such as laryngoscope fiber optic handle with miller blades, laryngoscope fiber optic handle with mac blades, laryngoscope matt finish handle with miller blades, laryngoscope matt finish handle with mac blades, laryngoscope fiber optic handle and blades and laryngoscope bulb. These are used is a medical field in order to obtain a view of the vocal cords and the glottis which is also called space between vocal chords. 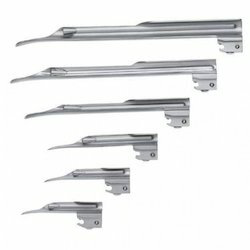 We offer these handles in various variety and ranges in order to meet client need. 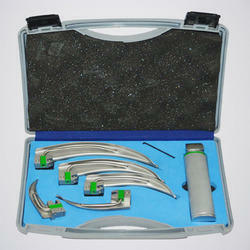 We also offer a wide range of Optic Fiber Laryngoscope (Adult) with miller blades. We have huge customers from all round the globe placing repeated orders for our product which are available in terms of quality & performance. We use optimum quality materials in the manufacturing of the conventional laryngoscopes ensures tensile strength and resistivity, high durability to adverse conditions. Mac Blades Size: 0, 1, 2, 3, 4, 5 No.